We asked Jon Riley to describe himself in 5 words and he chose, “Adventurous, Easy-going, Positive, Sharing, Creative”. 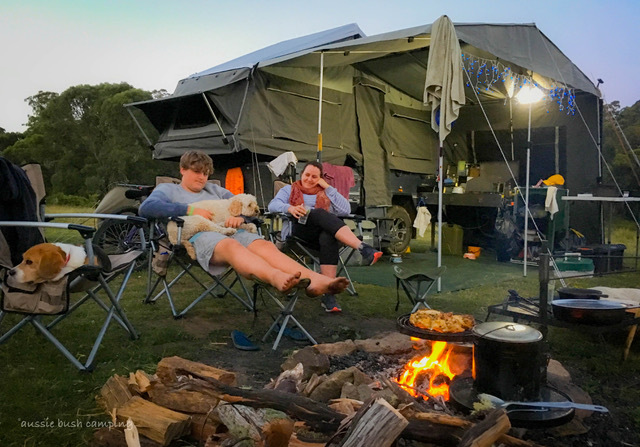 After interviewing him, we found out he is passionate about the outdoor lifestyle, is a proud and committed family man plus a damn good bush chef! 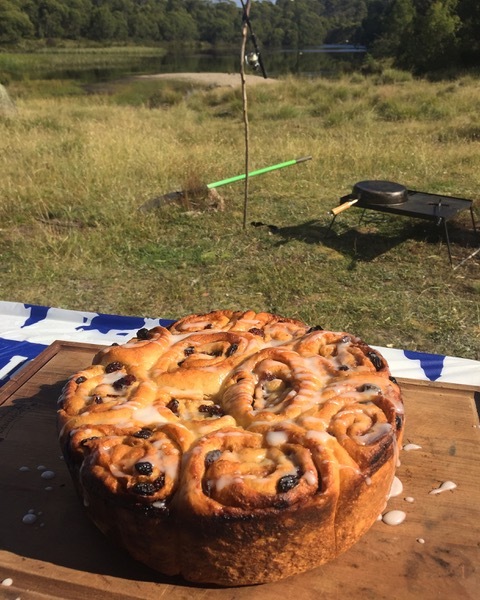 If you are in need of a little ‘bush cooking’ inspiration, you might enjoy this Write-Up and some of Jon’s recipes. Originally from England. My then girlfriend, now wife Karen and I came over to Australia in 1999 for a one year holiday to travel and explore Australia. One year later Karen fell pregnant with Zach, and I gained sponsorship through skilled migration as the head chef of ‘The Dolphin’ on Crown Street in Sydney allowing us to stay. Located still in Sydney, we are humbled by the fantastic country we have adopted as home. Ever considered a BIG LAP of AUSTRALIA? A lap of Australia is very high on my bucket. We would love to make a couple of big trips to the Cape and the Simpson. My son Zach is 16 and now at TAFE studying photography so supporting him through his education is a priority so we get away when we can for weekenders and short trips. We are starting to plan a trip to Tasmania. It’s quicker to do a lap of Tasmania than it is of Australia – lol, and another Fraser Island trip is on the cards soon. 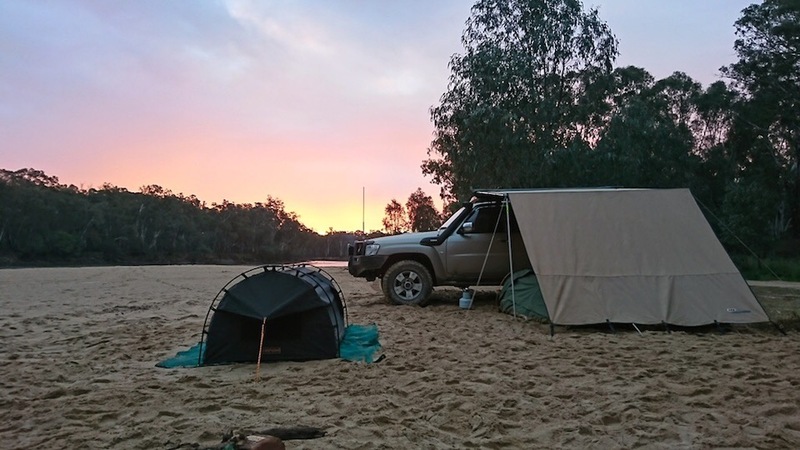 Current OFF-ROAD VEHICLE including your SET-UP? We have a 2011 VW Amarok which has been a labour of love building up from a stock Amarok. The truck is set up for quick weekenders and touring so has onboard auxiliary power, 3000w inverter, 65ltr CFX Waeco fridge freezer all powered by a Redarc BCDC to charge the batteries with a 120w solar Panel mounted on the roof to keep us powered when we are pulled up. Along with swags and a Foxwing awning for cover, it makes a grand tourer. 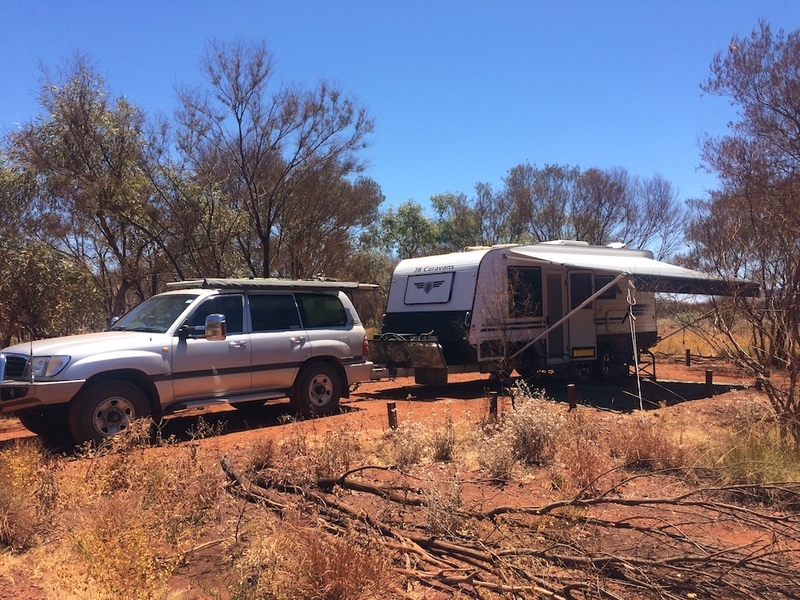 Our CAMPER TRAILER is an Ezytrail Sterling GT forward folder. 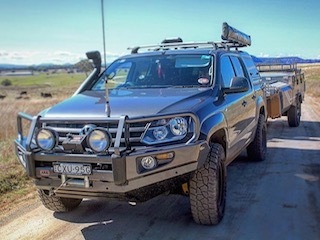 A tremendous off-road camper trailer that gets the 3 of us and the two dogs bikes and kayaks away to remote hidden locations with ease and has all the comforts of home. What inspired your ADVENTUROUS lifestyle? I was very spoilt when I was young being brought up on a farm in Somerset England and spent every spare hour out camping, exploring, shooting and spending days on end living in the woods, eating rabbits and fresh trout so have always loved the outdoors. I am fortunate to have my son Zach who is as passionate as I am for the outdoors and he has been camping with me since he was 4. He then spent years in the Cubs and Scouts only growing his love for the outdoors even more. Our Instagram pages were developed really out of a means of wanting to document our adventures. There is a massive sense of freedom that comes with camping and a way of escaping the bricks and tarmac of daily life. Favourite RECIPE to COOK on the road? 1. Breakfast camp oven baked eggs with chorizo, tomato and beans. 3. And either my Sticky Date Pudding with almond praline and butterscotch sauce or a beautiful Seasonal Fruit Crumble Pie. * You can find more of Jon’s recipes on his social media pages. Cooking on an OPEN FIRE or GAS STOVE? Campfire every day of the week! 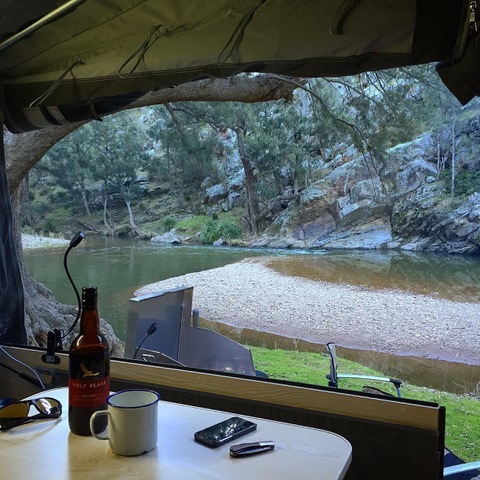 I prefer Autumn and Winter camping as you don’t get the fire bans of summer. There is nothing that comes close to the flavour a campfire and cooking over wood gives your food. It does take a little practice but stick with it, and you’ll succeed. One COOKING UTENSIL you wouldn’t leave home without? My Camp knife and Camp Oven! There isn’t much you can’t do in a camp oven with a bit of practice. A good camp knife gets used for everything from prepping dinner, eating or whittling wood around the bush TV at night. What essential skills have you been able to pass onto your son? My boy is a phenomenal cook, and I like to think I have inspired him continuously with food and cooking from a very early age, and our love for photography. He has been with me for almost every camp we have been on, and now I happily let him take the reins and cook his old man dinner. 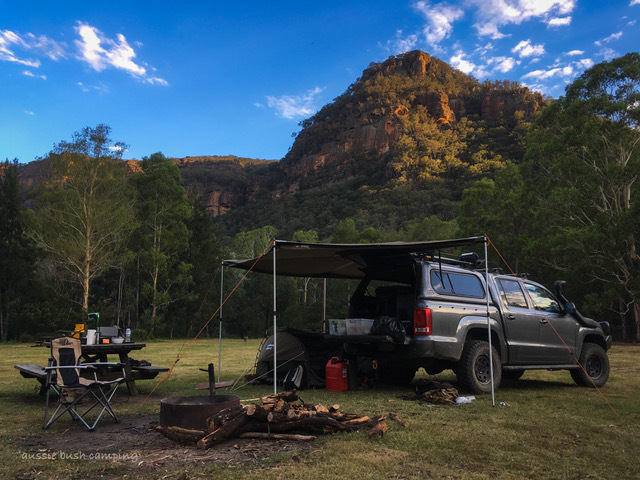 Camping and Cooking are both playing a big part in his life and career path now with his training in photography at TAFE but also his big love is in food photography and food styling. It makes me very proud (as it does any parent) to think I had a part in providing him with the skills he now is passionate about and loves. 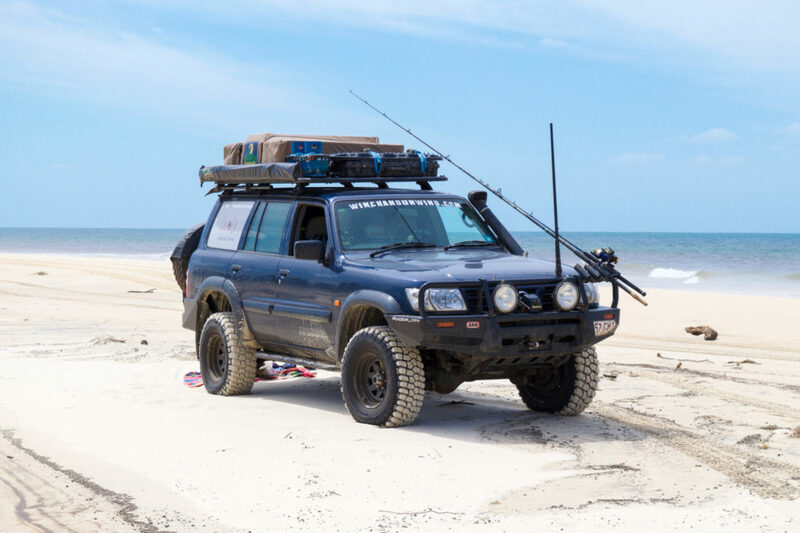 Taylor fishing on Fraser Island at the start of the season! I’ve never seen fishing like it! Every cast you get a hit and pull in a massive Taylor but standing in line with 30 others all doing the same thing waste deep is something I will never forget. Craziest fishing I have ever seen! 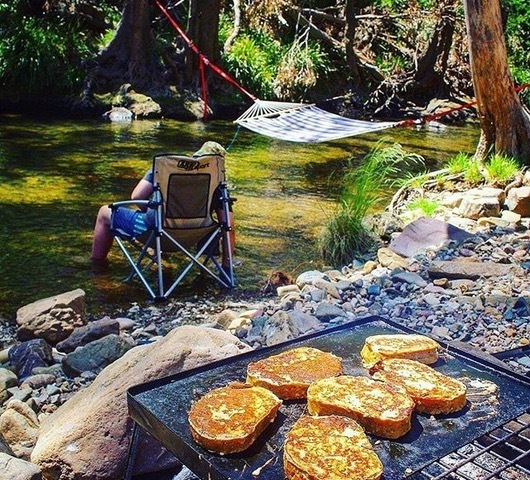 Anywhere remote that no one else knows about in amongst mountains where you camp on the edge of a pristine trout river, fly fishing, relaxing, cooking and spending it with my beautiful wife and son. Bliss! Biggest MECHANICAL FAIL? Were you able to fix it? Coming back from Mirramurra Falls near Wollongong and the Engine on the Rok Blew up! It spent eight weeks at VW and thanks to VW Australia they came to the party and dug deep into their pockets, replaced the Engine, turbo manifold, clutch and flywheel. We will be forever thankful as I would not be writing this today had they not helped out so much. 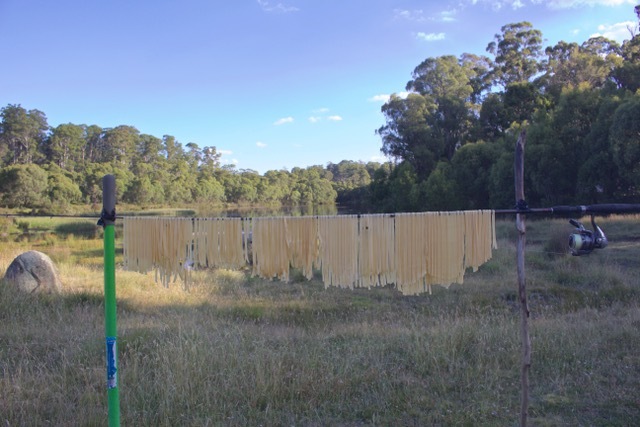 Any BUSH COOKING advice to pass on to outdoor enthusiasts? 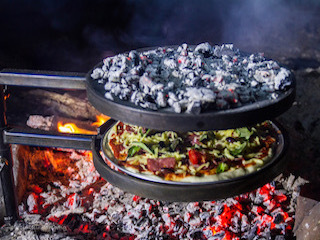 Cooking on a campfire is one of the nicest ways to prepare anything personally. 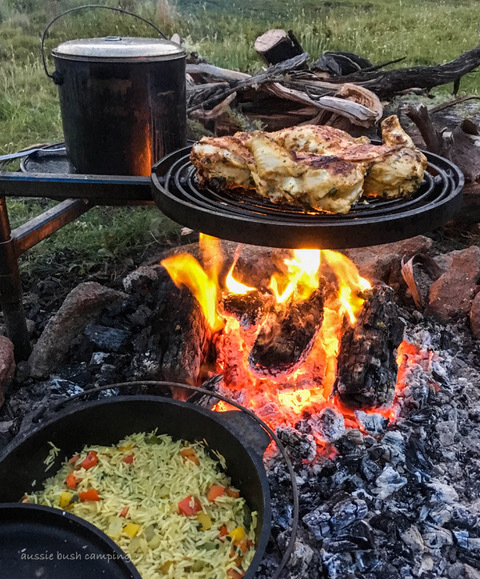 It does take a bit of practice to learn how to use the heat in different ways, but nothing is more satisfying when you crack that camp oven lid and see a beautiful damper or stew bubbling away, it gives you a great sense of satisfaction! Start off with some simple dishes and get yourself an excellent 4.5-quart camp oven and your away. Practice makes perfect. If you can cook a meal, you love at home try making it on the campfire. Pre-make some of the elements or pre-marinade your meats, pre-weigh out your bakery recipes in ziplock bags to make life easy. 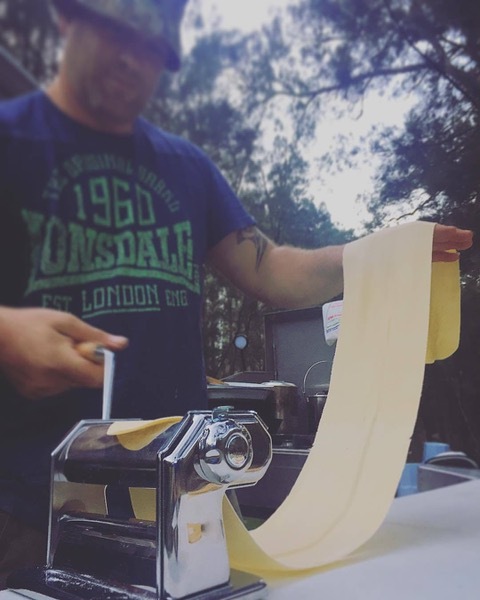 One of the reasons I started the ‘Gourmet Camp Chef’ page since giving up life as a professional chef was that I needed an outlet for my passion and I hoped to inspire people to try cooking something a little bit more adventurous than the standard sausages, bacon and eggs. It’s exciting when people tag you in pictures of the recipes that they have tried and enjoyed!